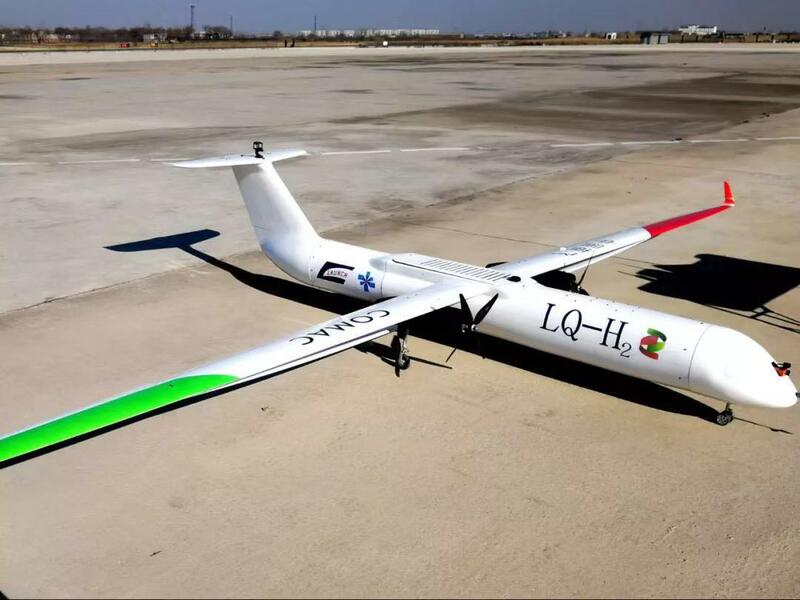 BEIJING, March 20 (Xinhua) -- The China-developed new energy battery-powered demonstration unmanned aerial vehicle (UAV), known as LQ-H, has conducted a successful maiden flight, according to its developer Wednesday. LQ-H, the technical demonstration UAV, conducted the flight at an airport in Zhengzhou in central China's Henan Province, said its developer Commercial Aircraft Corporation of China (COMAC), which is also the developer of China's C919 large passenger airplane. Powered by a hydrogen fuel battery, LQ-H had a smooth flight with all systems in good condition. And its battery power system has been fully validated, COMAC said. COMAC said it was substantial progress for them in terms of exploring new energy aircraft. With a wingspan of 6 meters, LQ-H uses a hydrogen fuel cell for its main power and a lithium battery as supplementary power. The demonstration UAV model uses multiple new technologies, such as 3D printing and compound materials, to lower its weight and pave the way for new-technology application in further manufacturing. Hydrogen energy could be acquired and through various sustainable energy sources such as solar power and wind energy. "It is one of the major research directions of global aviation industry to construct a low-carbon sustainable transportation system by utilizing hydrogen energy," said Yang Zhigang, pre-research chief designer of Beijing Aeronautical Science and Technology Research Institute of COMAC. The LQ-H series technical demonstration aircraft includes four configurations, which feature in fixed and retractable landing gears, and three different empennage types. Through iterative evolution, the endurance of the LQ-H aircraft is expected to reach 24 hours. The LQ-H series was jointly developed by a research team from subsidiaries of COMAC and State Power Corporation Limited, generating professional and technical resources from a domestic university and several companies. More new configurations and technologies of the LQ-H series will be developed through the new energy-powered aircraft as a platform. Moreover, plans for its industrialization development are underway, according to COMAC.